● Started 14th and finished 13th. ● On lap 17, Earnhardt reported that his No. 81 Xtreme Racing Toyota Supra was free on entry into turns one and two, and free in the center of turns three and four. ● At the end of Stage 1, Earnhardt said his car still needed more rear grip, but that the entry had tightened up. ● Pitted from the 13th position on lap 48 for four tires, fuel and air pressure and wedge adjustments. ● Returned to the track in 14th for the start of Stage 2. ● Started 14th and finished 15th. ● Earnhardt gained three spots at the start of Stage 2 and worked his way into the top-10 just before the third caution of the race on lap 57. ● Under the caution, Earnhardt told the team that the adjustments made during the Stage 1 break helped the No. 81 Xtreme Racing Toyota Supra on the restart, but it was now tighter in the center of turns one and two. The team chose not to pit and restarted 10th on lap 63. ● While running 15th when the caution flag waved on lap 79, Earnhardt radioed that his car was tight in the center and free on entry. ● After pitting on lap 84 for four tires, fuel and another air pressure adjustment to give the car more front and rear grip to help it roll the center of the corner better, Earnhardt returned to the track in 16th. ● Restarting with three laps to go in Stage 2, Earnhardt battled for position until the end of the stage, gaining one spot to claim 15th. ● Started 12th and finished eighth. ● Earnhardt struggled with a loose-handling racecar for the first 35 laps of the run, but was able to maintain his 12th-place standing until the seventh caution of the race on lap 125. ● Earnhardt came to pit road on lap 128 for four tires, fuel, and an air pressure adjustment to reverse the changes made on the previous pit stop. After losing time getting into his pit box to avoid an incident with another team, Earnhardt lined up 18th for the lap-131 restart. ● On lap 132, Earnhardt reported a vibration just as the caution came out for an incident in turn two. He pitted on lap 136 to check for a loose wheel, receiving four tires and fuel during the stop. ● Restarting 18th on lap 139, Earnhardt took advantage of his fresh Goodyear tires and gained four positions in two laps. ● Despite working his way up to 12th by lap 169, Earnhardt said he had no grip in the front tires and that it was even worse when trying to pass other cars. ● Earnhardt made his way back into the top-10 on lap 186, but a caution on lap 189 slowed his progression. ● Close on fuel to make it the final 11 laps, Earnhardt brought the No. 81 Xtreme Racing Toyota Supra to pit road for four tires and fuel. The No. 81 team maintained its positon to line up 10th for the lap-194 restart. ● Earnhardt used those fresh tires to his advantage, picking up two positions to finish eighth. ● This was Earnhardt’s second straight top-10 Xfinity Series finish and his first top-10 in four career Xfinity Series starts at Texas. ● This was the debut race for XCI Racing. Its next race is the April 28 Monster Energy NASCAR Cup Series race at Talladega (Ala.) Superspeedway. The team will return to the Xfinity Series June 29 at Chicagoland Speedway in Joliet, Illinois, July 5 at Daytona (Fla.) International Speedway, Aug. 16 at Bristol (Tenn.) Motor Speedway and Aug. 31 at Darlington (S.C.) Raceway. XCI Racing will finish its maiden season Oct. 13 in the NASCAR Cup Series race at Talladega. ● There were nine caution periods for a total of 50 laps. ● Only 14 of the 38 drivers finished on the lead lap. 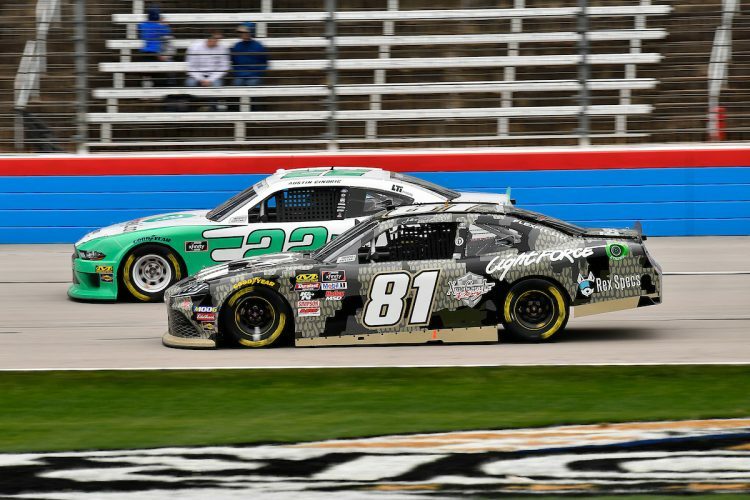 ● Kyle Busch won the My Bariatric Solutions 300 to score his 95th career Xfinity Series victory, his third of the season and his ninth at Texas. His margin of victory over second-place Tyler Reddick was .861 of a second. The next event on the Xfinity Series schedule is the Alsco 300 on Saturday, April 6 at Bristol (Tenn.) Motor Speedway. The race starts at 1 p.m. EDT with live coverage provided by FS1.